What was it like to be the wife of a deep undercover CIA officer during the Cold War? 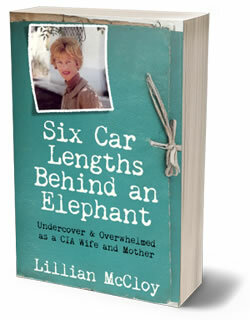 Lillian shares her story in a series of personal anecdotes, sharing her real experiences as a spy’s wife managing the care of three children, supporting her husband’s work, keeping the secret, and moving the family from country to country to country. Readers are giving this book five-star reviews, describing it as “compelling,” “fascinating,” “funny,” “a can’t put down book,” and a “must read.” This memoir is also very popular with book clubs. Did you enjoy Six Car Lengths Behind an Elephant?